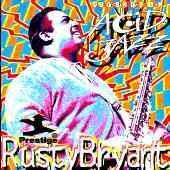 Rusty Bryant - "Legends of Acid Jazz"
Acid jazz, as we know it today, was in large part the creation of Bob Porter. The producer`s primary contribution to the genre was a hiring two of the funkiest drummers on the planet - Bernard ‚Pretty' Purdie and Idris Muhammad - to lay down fatback R&B grooves on jazz dates at Prestige Records. Porter also brought veteran alto and tenor man Rusty Bryant to the label and proceeed to update the West Virginia-born, Ohio-based saxophonist`s big old-school sound via classes at the new soul-jazz academy. Purdie and Muhammad both contribute to these sessions, as do such other acid-jazz heroes as Boogaloo Joe Jones, Melvin Sparks, and Charles Earland, helping Bryant to acheive a soulful A + throughout.